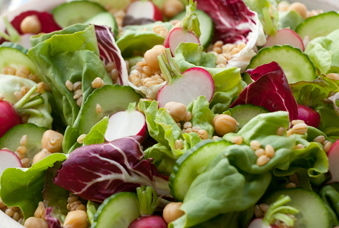 Combine mixed greens, radicchio, barley, garbanzos, radishes and cucumber in a large bowl. In a small bowl, mix together lemon juice, apple juice, green onions and 1 tablespoon water. Drizzle dressing over the salad and toss. This salad is a great salad that everyone loves. Its super healthy and delicious. Be sure to dress the salad prior to eating. If you are preparing the salad ahead set the dressing aside until you are ready to serve. Super quick and nutritious. I prefer to get the garbanzo beans and barley dried as they are much more affordable and I can get so much more for less without the added sodium and preservatives most canned options provide. If you do not wish to use the dried which you will need to soak then the canned organic is OK, just be sure to get the no sodium, no salt canned option. Loved this. It is now my new favorite. We will definitely be making it again. Such an incredible salad! I must say it is one of my favorite recipes. Cheers to such a great site! Keep it up.